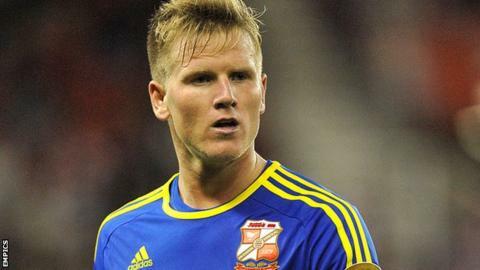 Matt Ritchie has said he was surprised by his move to Bournemouth and he leaves Swindon with a "heavy heart". The Cherries paid £500,000 for the former Portsmouth winger and the Robins have since revealed the deal was needed so they could raise extra funds. The League One club are in the process of being sold to a local consortium. "It was my understanding that it was for the best interests of the club that they sold me. It was very sharp," Ritchie told BBC Wiltshire. Last season Ritchie was an influential part of Swindon side that won League Two, as he scored 10 goals and was named Player Of The Year. When the winger was being courted by Bournemouth last year, Di Canio publically placed a £2m price tag on his star player saying only "crazy money" would tempt him to consider any offers. In a statement on their website, Swindon said the decision to sell Ritchie was a joint one between the current and potential new owners as they wanted to raise funds as the takeover is completed. "I didn't know much about it until the last couple of hours. I was on my way home from training when I got diverted to Bournemouth. I got a call from my agent who said it was part of the deal for the club to be sold," Ritchie added. "I had great times at Swindon. It was brilliant when the gaffer came in. To get promotion was an amazing achievement. This year we've started well and look like strong contenders to get promoted. "I leave with a heavy heart. I'll miss everyone there, especially the gaffer. I felt like he helped me a lot and made me the player I am today. I've got a lot to thank him for. "I am looking forward to the challenge at Bournemouth and hopefully get promoted. It would be good if it was both teams going up to the Championship."